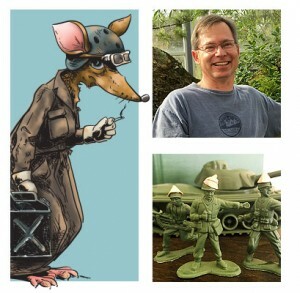 Rat’s Patrol was originally founded to organize and run Flames of War tournaments in the home of the mouse: Orlando, Florida. This is no perky, singing band of mouseketeers with a manically grinning mouse mascot in short-pants. Rat’s Patrol is led by Ratso, a grumpy, chain-smoking, tanker rat with a can of gas and idea about where it might be put to good use. The crew doesn’t run tournaments any more and has moved on to lots of other games but the can-do-it-my-way spirit endures. Being a rat of few words, Ratso let’s Ed do most of the talking and writing around here. Ed is a former Army officer. Party Platoon has been a long time resident of the bookcase and can frequently be seen helping out in photos, keeping Ed in line and generally having a good time.